Adult and juvenile spotted handfish. Adult spotted handfish mature at about 23 years old at which time they are 7075 mm in length. They reach a maximum size of about 150 mm. Handfish are small, bottom-dwelling fishes that would rather walk on their pectoral and pelvic fins than swim. They are native to Australia and five of the eight identified handfish species are found only in Tasmania and Bass Strait. 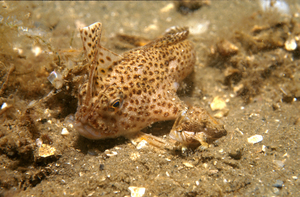 The spotted handfish is endemic to Tasmanias lower Derwent River estuary. In 1996, the spotted handfish became the first Australian marine fish to be listed as endangered. Scientists, government and the community are involved in a federally-funded recovery plan for the spotted handfish led by CSIRO Marine Research.